Cllr Mark Dobson (left) and Edward Cooke (right) present headteacher Joanne Blacoe and Horsforth Newlaithes primary school pupils with their recycling reward. Schools in Leeds are being rewarded for recycling old electronic equipment that might otherwise have ended up in landfill. Horsforth Newlaithes Primary School and Whitecote Primary School have been presented with cheques as a thank you for their outstanding recycling efforts. The schools are two out of seventeen around Leeds to have Waste Electrical and Electronic Equipment (WEEE) banks installed. The old, unused gadgets and gizmos are collected by Weeelink, the council’s partner, and broken down to be recycled. Much like bottle-banks, the WEEE banks allow children and their families to get rid of their unwanted electrical items in a way that is not only safe and environmentally friendly, but also benefits the schools. When the WEEE Banks were first installed in July, Weeelink offered a reward of £50 to every school who could fill their bank by the end of term. Horsforth Newlaithes Primary School recycled a total of 92 electrical items. Whitecote Primary School came in second with 53 items. Given their efforts, Horsforth Newlaithes Primary School were presented with a cheque for £100 and Whitecote Primary school received £50. The cheque for Horsforth Newlaithes primary school was presented by Councillor Mark Dobson, Leeds City Council’s executive member for the environment and Edward Cooke, director of Weeelink, at a special event last week. “Well done to all the schools who participated, and congratulations to Horsforth Newlaithes and Whitecote primary schools on their fantastic achievements. “This effort is inspiring in many ways and we hope the children and their families will continue to lead our city in becoming cleaner and greener, encouraging others to recycle and consider the long-term environmental consequences of their actions. “I am delighted with the efforts of staff, pupils and parents, and we are all proud of how much has been recycled in such a short space of time. We are looking forward to the new opportunities this reward will afford us and the children are excited at the prospect of developing more environmental projects as a result. It is estimated that one million tonnes of electrical items are thrown away in the UK every year. Because of new developments in technology and the new trends that follow those developments, more and more people are using more and more technology, and gadgets are going out of style faster than ever before. Electrical waste of this kind is growing three times as quickly as any other type of waste. Leeds City Council wants to make it easier for children and their families to recycle so that nothing valuable is wasted. With more and more schools in Leeds striving to become more sustainable, the WEEE banks let young people and their families recycle on their way to school and recycling becomes a part of everyday life. Participating schools will be offered a new incentive for this academic year to encourage them to continue recycling gadgets. Each term there will be first, second and third prizes of £500, £300 and £200 for the schools that collect the most electrical equipment. 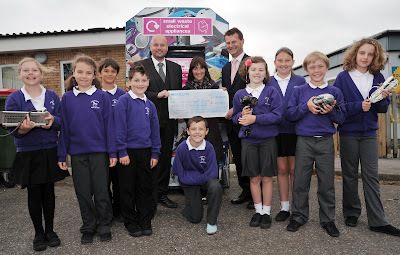 School councils can spend this cash on developing new environmental projects. Items that can be placed in the WEEE banks include: battery operated toys, CD players, chargers, clocks and watches, computer keyboards, electrical DIY and gardening tools, DVD players, cables, electric toothbrushes, electric toys, hairdryers, hair straighteners, internet boxes, irons, kettles, phones, radios, remote controls, shavers, small electric fans, small kitchen appliances, toasters and video cameras. The first seventeen WEEE banks have been placed at: Whitecote Primary School, Five Lanes Primary School, Stanningley Primary School, Guiseley School Technology College, Bramhope Primary School, Horsforth Newlaithes Primary School, Yeadon Westfield Infant School, Broadgate Primary School, Kippax North Junior, Infant and Nursery School, Westerton Primary School, Cottingley Primary School, Rothwell C of E Primary School, Drighlington Primary School, Meadowfield Primary School, Temple Moor High School, Colton Primary School and Little London Community Primary School. Currently over a third of all schools are registered with the Leeds sustainable schools framework working to improve their environmental performance across a range of areas including energy, waste, building, grounds and global links.